A visitor to London walking along the Thames from the Tower of London towards Blackfriars passes from Vintry into Queenhithe Ward. John Stow, writing in 1598, tells us that it was "so-called of a water-gate, or harbour for boats, lighters and barges; and was of old time for ships, at what time the timber bridge of London was drawn up, for the passage of them to the said hithe, as to a principal strand for landing and unlading against the midst and heart of the city." 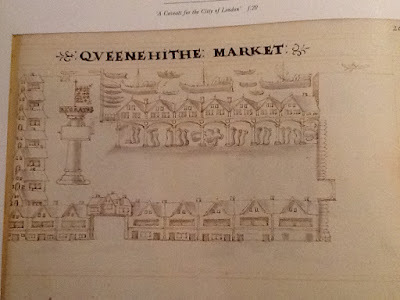 Queenhithe in 1676, by John Ogilby (image is in the Public Domain). The harbour itself is not only the best-preserved of the original city docks, but also probably the earliest. Following the collapse of Roman governance in 410 AD, the walled city of Londinium and its wharves had been, over a period of three or four generations, abandoned, in favour of a new Saxon settlement, Ludenwic, to the west, where ships could be beached on what is, today, The Strand. In the winter of 871-2 AD, however, the "Great Heathen Army" of the Danes overwintered at London, refortifying the old Roman defences against the forces of King Alfred the Great. More than a decade later, having finally defeated them, Alfred decided to reoccupy the Roman city, in order to ensure that it could never again fall into the hands of his enemies. Land in what is today Queenhithe Ward was given to a Mercian nobleman named Edred, who established the harbour. Edredshithe subsequently became Ethelredshithe, and ultimately Queenhithe after 1100 when Henry I granted the duties on goods landed there to his Queen, Matilda of Scotland, herself a descendant of the pre-Norman Anglo-Saxon royal line. Henry III, in 1225, commanded the Constables of the Tower of London to arrest the ships of the Cinque Ports as they sailed up the Thames, and to compel them to bring their corn to no other place but to the Queen's Hithe only. 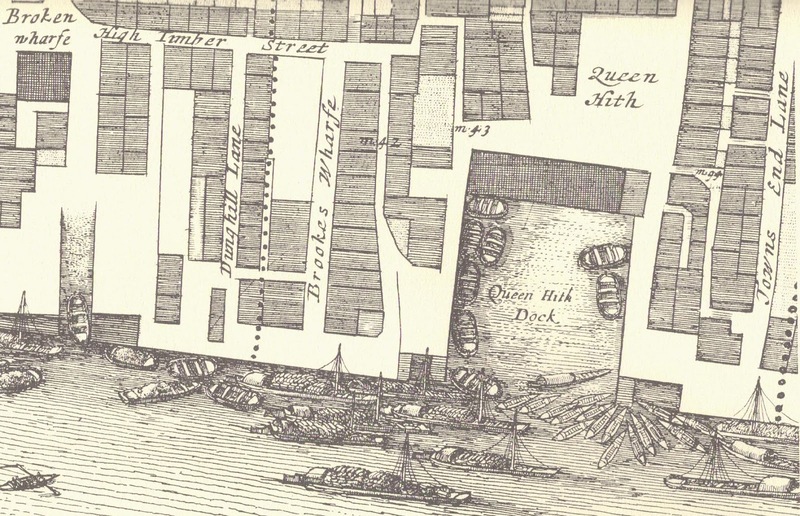 By John Stow's time, however, the access of large ships to what was called the "Inner Pool" (the stretch of the city waterfront lying to the west of London Bridge) had become very much restricted, and the role of Queenhithe in securing London's grain supply was much diminished. As grain merchants moved elsewhere, skinners and fur-traders moved in: a market was established at the head of the harbour, and the area remained the centre of the London fur trade into the Twentieth Century, with cargoes being brought upstream by the boats, lighters and barges described by Stow. 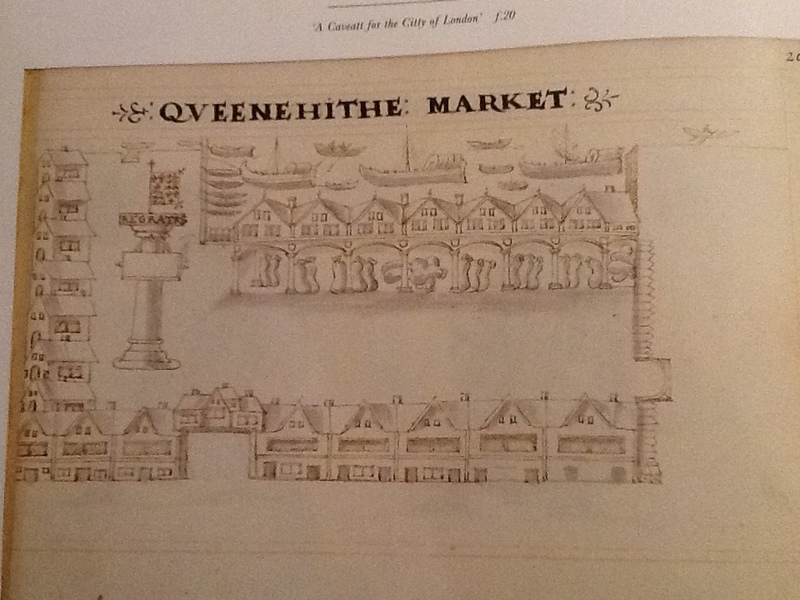 Queenhithe Market in the 1590s, by Hugh Alley (image is in the Public Domain). Alley was a minor city functionary, responsible for prosecuting those who infringed market regulations. 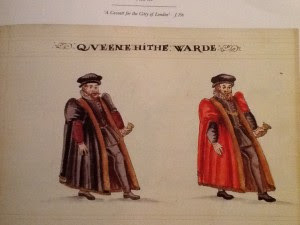 Two gentlemen of Queenhithe, by Hugh Alley (image is in the Public Domain). The man on the right is Alderman John More, Master of the Skinners Company from 1597 to 1601, who also served as Sheriff of London, and was on the Committee of the East India Company. The man on the left is thought to be Paul Hawkins, a vintner and a Common Councilman of the Ward. 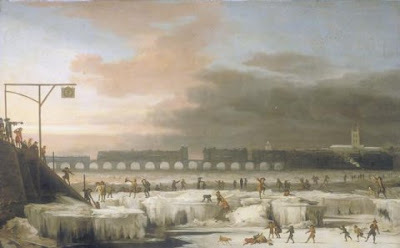 During the coldest phases of the "Little Ice Age," in the 1650s and 1770s, the skinners and furriers of London must have found their products in especially high demand. The narrow arches of London Bridge slowed down the flow of the Thames, allowing the river to freeze over for weeks at a time. The "Frost Fairs" were among the earliest examples of what we might now think of as "pop-up" businesses. Impromptu "streets" and "roads" were set up across the ice, with ox-roasts, gingerbread stalls and gin-joints. "Purl" was a particular favourite - a hot concoction of gin and "wormwood wine." The Frost Fair of 1677, by Abraham Hondius (Museum of London, licensed under CCA). "At every glance there was a novelty of some kind or another. Gaming was carried on in all its branches. Many of the itinerant admirers of the profits gained by E O Tables, Rouge et Noir, Te-Totum, Wheel of Fortune, The Garter were industrious in their avocations, and some of their customers left the lures without a penny to pay the passage over a plank to the shore. Skittles was played by several parties, and the drinking tents were filled by females and their companions, dancing reels to the sound of fiddles, while others sat around large fires, drinking rum, grog and other spirits. Tea, coffee and eatables were provided in abundance ... Several tradesmen, who at other times were deemed respectable, attended with their wares, and sold books, toys, and trinkets of almost every description." 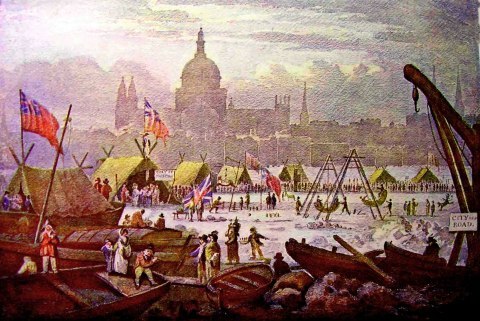 The Frost Fair of 1814 (image is in the Public Domain): the crane with the sign reading "City new Road" is situated close to the Southern end of today's Millennium Bridge. 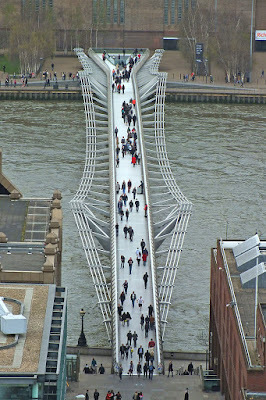 Many buildings in the ward were destroyed during the Blitz, and the area suffered a steep decline in the mid-Twentieth Century, but has since been regenerated, not least by the construction of the Millennium Bridge, linking Saint Paul's Cathedral with the major new cultural attractions of Tate Modern and Shakespeare's Globe. 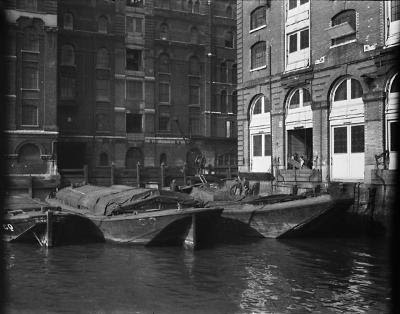 Queenhithe Dock in 1923, by Waldo McGillycuddy Eagar, National Maritime Museum (image is in the Public Domain). 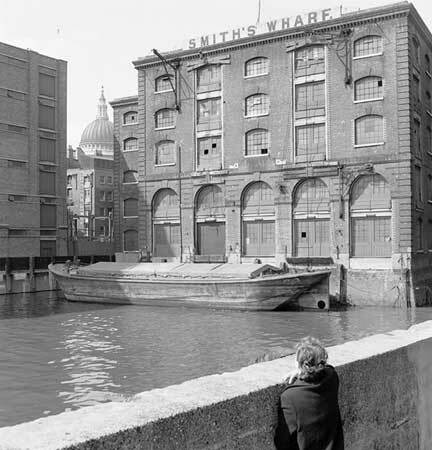 Smith's Wharf, Queenshithe, by Eric de la Mare, 1950s (English Heritage, National Monuments Record AA98/05348 - image is in the Public Domain). 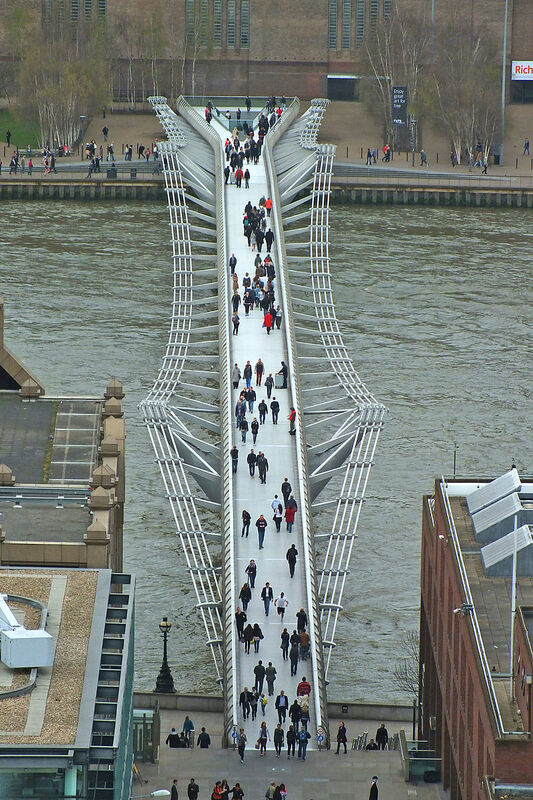 The Millennium Bridge from Saint Paul's Cathedral (photo: Jan Kamenicek, licensed under CCA). Mark Patton's novels, Undreamed Shores, An Accidental King and Omphalos, are published by Crooked Cat Publications, and can be purchased from Amazon. He is currently working on The Cheapside Tales, a London-based trilogy of historical novels. Thank you, Mark. Really interesting. The illustrations you've found are wonderful. Informative and interesting, Mark, as always.